Grab the Family & Get Outside! Just 23 miles from the heart of Helena, and overlooking the former mining town of Marysville, the Great Divide ski area consists of ski-all terrain (thank you, beetle-kill) spread over 1600 acres. Kevin Taylor has owned Great Divide since 1985, but actual ownership of the slopes gets tricky. “This is mining country so it’s checkerboard ownership,” says Taylor. He owns most of the old Thomas Cruse mining claims and the remaining land is leased from various sources. In cooperation with the Great Divide Ski Team (a separate entity), groups such as the All Mountain Team teach kids how to ski in a noncompetitive atmosphere. The Mountain Moms program encourages moms to get out of the lodge (forget knitting!) and learn the skills their children enjoy. Taylor’s genuinely friendly disposition adds to the family-feel. Tom Bovington says, “Kevin is incredibly generous. Our family bought season tickets one year. My wife broke her ankle and couldn’t ski. Kevin rolled her pass to the next year.” It’s gestures like this that make Kevin’s name synonymous with skiing in the Helena area. 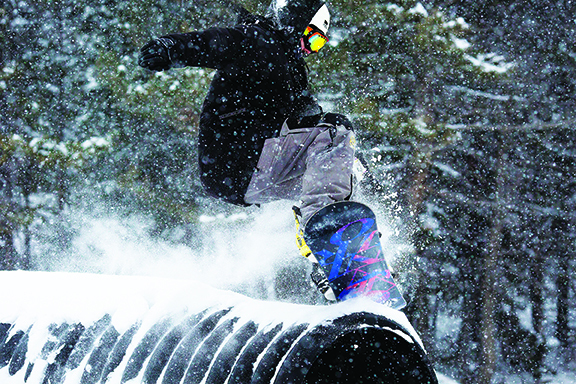 Scattered among Great Divide’s skiable acres are the well-known terrain parks. “We have six terrain parks with 60 to 70 features when they’re all up and running,” Taylor adds. Even more impressive is learning the layout of the parks, as they are changed on a weekly basis. “It’s a variation on coming down the hill and going left or right. You can throw tricks on them and impress your friends. Terrain parks are a whole new athletic endeavor we never did when we were young.” That’s what keeps skiers coming back. Made up of boxes, rails, and jumps, terrain parks take “energy, money, machinery, and time,” says Taylor. But he is committed to keeping things fresh. One week you might be gliding over a propane tank, the next week it might be beer kegs, the week after that? You’ll just have to come and see for yourself. Taylor will tell you Great Divide’s success is built on simple economics. But perhaps his recipe for success is even simpler than that: Family-friendly and Fun. Heather Bode lives in Helena with her husband and five children. She enjoys writing nonfiction for children and adults.